PTO collects labels as a part of our fundraising efforts. We collect labels during the school year and hold label collection contests between classrooms generally twice a year. These labels are counted, sorted, and sent off to the appropriate company for redemption. Follow the information below to learn more about the label programs we participate in. On the website you may sign up for email updates, enter to win Box Tops for our school and check our school’s earnings. To help us earn, clip Box Tops off products and submit to the school. Each collected is worth 10¢ and goes toward purchasing items for the students or school. Follow BTFE on Facebook for updated information and special offers to earn additional Box Tops. Examples of Box Top products may include Kleenex, General Mills cereal, Pillsbury, Betty Crocker, etc. Eligible Box Tops are clipped/trimmed and not expired. These come in all different sizes. A full participating product list may be found here. To help us earn, clip Best Choice UPCs, available on most all Best Choice products. Each label is worth 3¢. Labels are redeemed and used to purchase items for the students or school. Eligible labels are clipped/trimmed containing the bar code, as well as the text "Best Choice" somewhere on the label. We have recently started collecting Tyson A+ points. Tyson Project A+ Points are valued at 24¢ each! Eligible labels are clipped/trimmed. Examples of label location on products may be viewed here. A full product list can be found here. New for the 2014/2015 school year! We have started collecting Auburn Pharmacy Caps. Auburn Pharmacy Caps are worth 25¢ each! 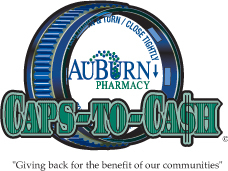 The Auburn Pharmacy Caps to Cash KIDS program is another great way to help us earn for our school.